Skydive Tecumseh is Michigan’s #1 longest running drop zone. Established in 1964, we’ve been helping Michiganders experience the joy of human flight for over 50 years! We recognize that skydiving is intimidating. Our job is to remove that intimidation as much as possible and make sure you feel welcome and part of our community. Though we skydive all of the time, it’s not lost on us that this is a big event and we’ll walk you through the entire process from training to leaving the airplane! We want this to be one of the greatest adventures you’ll do in your life! We’re not striving to be like every other skydiving center in America. We’re neither the cheapest nor the most expensive, but what you can expect is care. We’re not striving to be like every other skydiving center in America. We’re neither the cheapest nor the most expensive, but what you can expect is care. We want you to have an experience that is transformative. Just as our owner’s life was transformed by his first skydive, we want you to experience the purity of flight in an environment focused on safety and five-star customer service. People just like you come from all over Michigan and the surrounding states to skydive with us. We even have jumpers from Canada! Our highly experienced staff, state of the art equipment and super-fast, modern plane designed especially for skydiving operations have helped make us the #1 choice for Michigan skydiving for 50+ years! 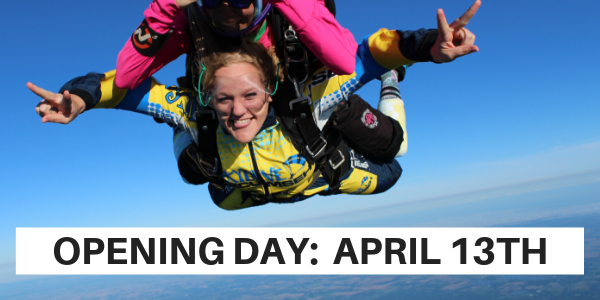 Just ask around – chances are you know someone who’s already jumped at Skydive Tecumseh! We invite you to learn more about Skydive Tecumseh by exploring our website. Should you have any questions, please contact us! We’d love to speak with you and answer any questions you may have about skydiving with us!